Today is the Opening Ceremonies of the 2012 Olympic Games! 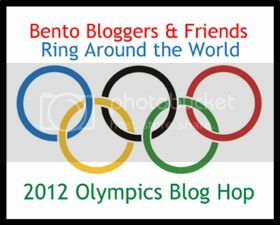 In celebration I am joining up with my bento buddies to bring you a spectacular Olympic Lunch Blog Hop! 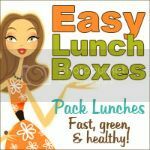 Click the button at the end of my post to check out the next lunch and then keep on hopping! I decided to make a mascot lunch before I had seen the mascots. I was slightly less amused once I looked them up. What is up with the weirdo mascots?! Oh well, Kidlet likes them! Kidlet has the Olympic Mascots made from cheese and food colors on top of a soy ham sandwich. On the side are blackberries, checkered apple, yellow bell pepper, and grapes. Great job on the mascots! I have no clue what those mascots are supposed to be and am baffled why London would use them. I know! The mascots this time around aren't nearly as cute as the ones in 2008 and 2010! 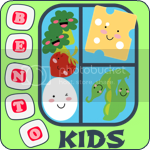 Great job on the bento though. Bravo! You made those weird looking mascots look cute. Great job! I agree with you. The mascots are confusing. The taxi lights on their heads really threw me. Wow!!! You are a true artist!! Those mascots are great! OMG.. this is insane! Fantastic job! Amazing mascots, Jenn! I was thinking of making it from hotdogs for a 3D effect but it just keeps on falling apart that's why I settled with my sushi dogs. Never thought of doing it on cheese. Impressive! you actually made those alien mascots look GOOD! you are such a great artist! You actually did them and they actually look kinda not awful! LOL! The mascots look great! WOW. They look like Snoopy when he dances, you know? his nose poking out in front and his head thrown back so you can't see his eyes? Your olympic mascots look like adorable superheros! I had to google "olympic mascots" to see what they looked like and the first hit was "Have You Seen the Olympic Mascots? London Is Just F***ing With us Now." There, now maybe yours will come up first and we'll all have fewer questions. 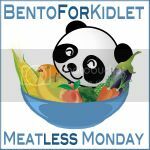 I'm planning an Olympic Mascot Bento this week, too! I love yours! Hey, I was wondering if you can give me a hand. 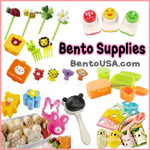 I'm trying to find the Origin site for Bento Bloggers & Friends so I can join future Blog Hops. Unfortunately all the links I find go to a non existent facebook page. Can you point me in the right direction?